► How can I find a suitable transfection reagent? Our "Transfection Reagent Selection Guide" supports you in the selection of the appropriate transfection reagent for your application. ► What is the role of the "innate immune system" for the transfection with synthetic carrier systems? The innate immune system is able to detect so-called "pathogen-associated molecular pattern" (PAMPs). These include e.g. cell foreign nucleic acids. Depending on how pronounced the "innate immune system" of a cell type is, the greater is also its ability to initiate defensive measures against a putative phathogen. This led to the development of the K2® Transfection System and later on the K4® Transfection System. ► What are the factors that determine whether a cell is easy, difficult or impossible to transfect with DNA? Using chemical transfection methods a critical role is played by the ability of a specific cell type to undergo endocytosis and proliferate, since the lipoplexes / Polyplexes initially escape into the cytosol via endocytosis and are there released from the endosomes. Lipoplexes / Polyplexes or decomplexed DNA can only penetrate to the cell nucleus (i.e. overcome the "nuclear barrier") if the nuclear membrane is permeable for a short time during division. If one of the two processes occurs in a poorly developed form, transfection efficiency may be lowered accordingly even if application of the transfection method is optimal. It is thus unsurprising that cells with low or no proliferation - such as primary or nerve cells - or cells with low endocytosis activity - such as Jurkat cells - are regarded as difficult to transfect. A further key factor is the innate immune system, which is differentially developed for every cell type. Cells are capable to detect foreign nucelic acids and to go into a defence state. Cells with a low developed innate immune system (e.g HEK293 cells) are accordingly easy to transfect and in contrast cells with a strong developed immune system (e.g. Jurkat cells) are hard to transfect. An exacerbating factor is that these phenomena given above may differ completely not only from cell type to cell type, but also among different genotypes of the same cell type. Differing behaviour may appear in cells of the same name in different universities or even different working groups within a single institution, and can also be observed during long-duration passaging of a cell line. This complexity reduces the options for transferring protocol parameters from one user to another to the minimum, even if apparently the same cell type is involved. ► I have always used a different transfection reagent. Can I now use e.g. Metafectene with the same optimized protocol as my old reagent? These differing properties have a direct and specific influence on their interaction with the DNA and the cell type in question. Because of this, protocol parameters cannot be transferred from one reagent to another. ► Can the transfectability of a specific cell type be predicted? No, this is not possible. The interactions of the highly specific properties of every cell type and every transfection reagent are so complex that predictions of transfection efficiency are futile. On the other hand there are empirical values, showing that e.g. quiescent cells, suspension cells and primary cells are as a rule hard to transfect. But no rule without exception. ► What are the ideal cell culture conditions for delivering optimum transfection results with DNA? 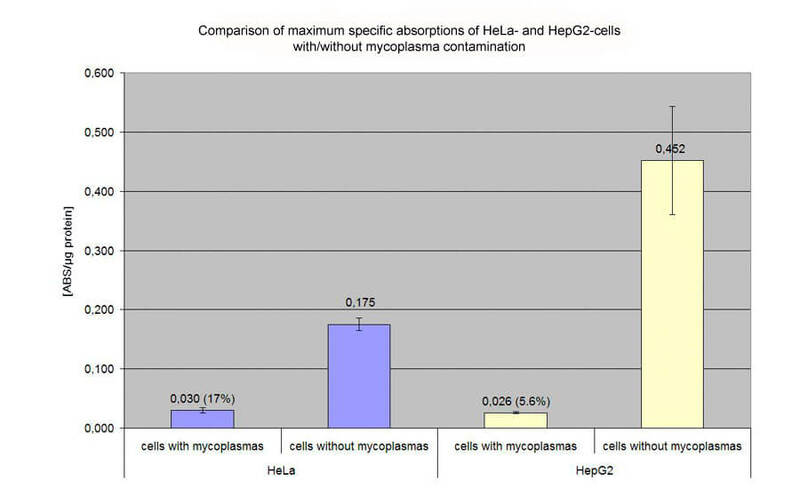 The number of cell culture passages should not exceed 30. A certain genetic differentiation takes place with each passage; this means that cells best able to resist the stress of passaging will proliferate disproportionately. In addition, the composition of the cell culture medium changes the physiological status of the cells, since the cells align themselves to the existing nutrient conditions. This causes the genetic divergences from the original cells to widen progressively. At the time of transfection cells should grow as fast as possible. 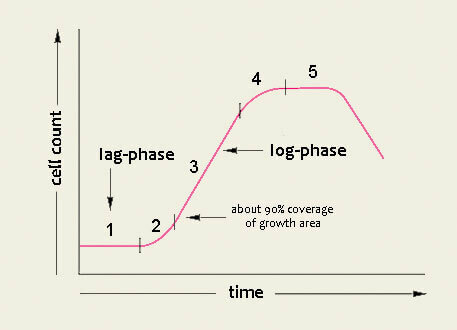 Cells should be permanently maintained in a state of high proliferation, known as the log or exponential phase. This phase can be achieved most easily by selecting a culture media suitable for fast proliferation and by creating a growing curve for the cell type to be used and for the appropriate format, and thus setting the optimum cell amount for seeding and growth duration. Owing to growth inhibition, cells that are periodically maintained in a confluent condition only regain their full growth potential after several passages. Optical confluence is not the same as actual confluence. The growing curve above indicates the extent to which visually determined confluence (where the whole growth surface is covered) corresponds to actual confluence (Phase 5 of the growing curve). These two confluence values generally diverge significantly. 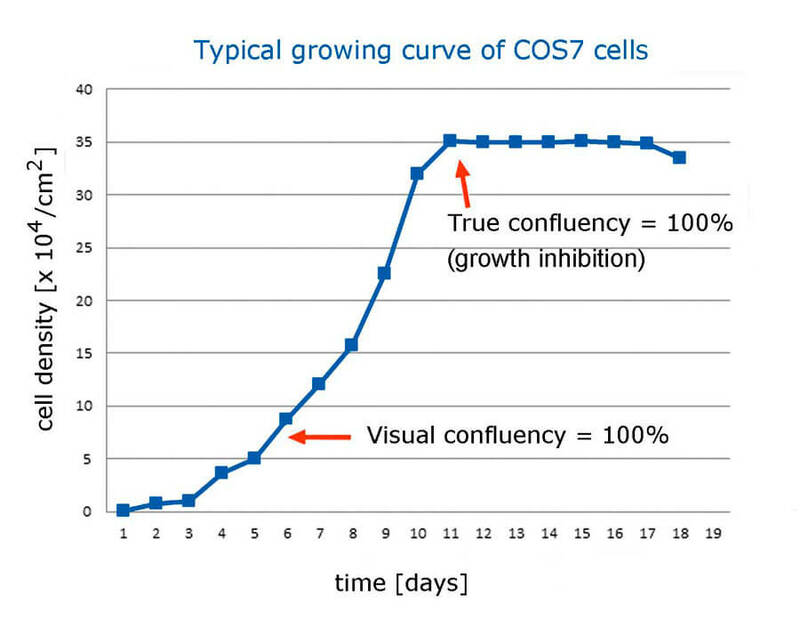 Taking the example of COS7 cells shown in the diagram, it is clear that in the most frequent case only the early growth phase 3 is achieved. For this reason, as a rule cells should have a visually determined confluence of around 90% on the day of transfection if the process is to be performed on adherent cells. ► How can I determine the optimum parameters for lipoplex formation? First the optimum ratio of DNA/RNA to lipids must be determined. It is generally assumed that lipoplexes require a positive net charge to be capable of electrostatic interaction with the negatively charged cell membrane surface for successful endocytotic absorption. In most cases this ratio approximates 1-7µl of lipid to 1µg DNA/RNA. The second key factor is the amount of lipoplex per cell; if this is too high the resulting toxicity over-compensates for the success of transfection. The amount of lipoplex should thus be varied to reflect the known optimum ratio of DNA/RNA to lipid. ► I have noted toxic effects in my transfection processes. What is the cause? Cationic lipids are able to diffuse into the cell membrane and to destabilize it. This is probably the main reason for increased toxicity as the amount of lipids in the lipoplexes increases. For this reason, high levels of lipids in relation to the amount of DNA/RNA can only be used to a limited extent. For reasons as yet unknown, lipoplexes have a significantly greater toxic impact on cells than do the transfection reagents themselves. It has to be assumed that the innate immune system triggers apoptosis after detection of foreign nucleic acids within the cell, which can hardly be distinguished from toxicity. This results in the second limitation: excessive lipoplex levels can impair transfection success. A further reason for toxicity may be the desired cell manipulation by expressed or inhibited proteins itself, which may have major effects on cell physiology. In this case, optimum transfection may lead to high cell mortality, which can only be avoided by downregulating transfection efficiency. ► How does the culture medium and serum used in the culture medium influence transfection success? The serum used in the cell culture (e.g. FCS, FBS) is a highly complex undefined mixture of water-soluble blood components such as growth factors and nutrients, and always has a significant influence on transfection success. Serum has extensive lipoplex-inhibiting properties. Because of this, serum must not be present during lipoplex formation (combining the transfection reagent and the genetic material). The lipoplexes formed with these transfection reagents can be added to the cells together with serum-containing cell culture medium without impairing transfection results. In fact, these reagents regularly deliver enhanced levels of transfection efficiency when serum is present. Serum supports cell growth behavior. Its components, such as growth hormones, significantly increase growth and thus the cell division rate of the cells to be transfected, which in turn significantly improves transfection efficiency. The proliferation behaviour of the cells should also be considered selecting a suitable cell culture medium. If there are more than one possibilities one should select a medium in which the proliferation rate of the cell is the highest. Because sera have an extremely limited shelf-life (maximum 1 month), care should be taken that the sera used are within their expiry date, since the use of expired sera would significantly impair the ingredients needed by the cells. 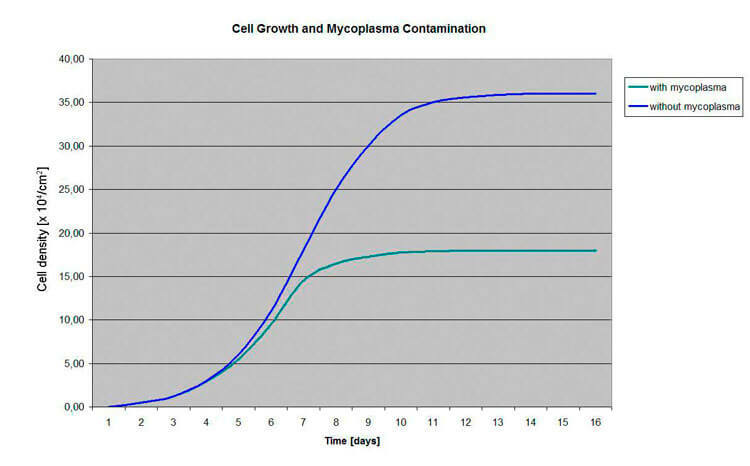 In this case cells show a completely different and reduced growth pattern (see diagram) and optimum transfection results can no longer be anticipated. Quality of serum may vary considerably from lot to lot. The variety of the ingredients can cause differnt transfection resulst, also if all other parameters were kept constant. ► Do mycoplasmas have an effect on transfection success? Mycoplasmas lodge in the cell membranes and may modulate cell membrane processes such as endocytosis. Mycoplasmas can proliferate in almost all known cell types and are thus ubiquitous. Roughly 80% of all cell cultures from Japan, 65% from Argentina and 15% from the USA are estimated to be contaminated with mycoplasmas. Main source are laboratory staff but also trypsine and serum, which are cell culture additives isolated from animal origin. ► How can I find out whether my cells are contaminated with mycoplasma and what is to do if this is the case? A long-standing detection method for mycoplasma is DAPI staining. However, this method only shows up significant levels of contamination owing to its extremely low detection sensitivity. The PCR method is significantly more sensitive and is thus the detection method of choice. Biontex offers the PCR based detection Kits MycoSPY® and MycoSPY® Master Mix which enables even single copies of the mycoplasma genome to be identified. In case of a contamination of the cell culture we recommend a treatment with MycoRAZOR®. ► What effect do the type of DNA/RNA and its quality have on transfection success? Because promotors have specific expression rates, cells have a characteristic amount, or amount per unit of time, of expression product. Specific characteristics of the gene to be expressed or of the resulting protein may, depending on cell type, significantly impact on the physiology of the cell or even cause cell mortality. Supercoiled plasmids are more efficient in transient transfection, while linear DNA is more suitable for stable transfection. ► I plan to change to a different cell culture format. What should I keep in mind? Lipoplexes adhere on free plastic surfaces of the cell culture vessels and are therefore lost for the transfection processThis is the reason why optimum parameters determined for a specific vessel format cannot be simply applied in proportion to other vessel formats. The smaller the vessel format used, the higher the lipoplex amount / mm² must be. When downscaling from a 6-well dish to a 96-well format, approximately three times the amount of lipoplex / cm² must be used to achieve comparable transfection efficiency. ► Does Biontex offer specific protocols for specific cell lines and transfection reagents? No. Given the large number of parameters given in the FAQs as influential factors in successful transfection, it is clear that supplying specific protocols for general use would be futile. The published case studies listed on our website can only give indications of how to achieve successful transfection as rapidly as possible, and generally cannot claim to be universally applicable. At last it may be neccessary to optimize in the own laboratory environment. ► What is the effect of the Freeze-thaw-cycle described in some manuals? Liposome formulations tend to coagulate during long term storage at room temperature or 4°C. This means that the size distribution is shifted towards greater liposomes, which may have negative effects on the transfection efficiency. Freezing and thawing lipids is a known method to produce liposomes and can therefore also be used to reestablish the ideal liposome size distribution for some transfection reagents. For this purpose this reagents are frozen in a freezer and afterwards thawed at room temperature. After soft vortexing the reagents are stored again at 4°C. It is recommended to perform such a freeze-thaw cycle before first use of the METAFECTENE transfection reagent series (METAFECTENE®, METAFECTENE® PRO, METAFECTENE® SI) and the K2® Transfection Reagent/K4® Transfection Reagent and subsequenly after a period of two months. ► How long can diluted solutions of transfection reagents, nucleic acids or lipoplexes be stored? In principle, charged molecules such as nucleic acids and cationic lipids or polymers tend to adhere to glass and plastic surfaces. While the loss of mass resulting therefrom is negligible in the case of highly concentrated solutions, the conditions for dilute solutions used for lipoplex formation are different. In our experience this effect is unavoidable. Polypropylene is still the best of the available materials for lipoplex formation vessels (before polystyrene and glass). Care should therefore be taken to leave the diluted solutions in the vessels for as short a time as possible. Lipoplexes also tend to adhere to plastic surfaces and, additionally, to "age." This means that the lipopolexes aggregate into larger units, which can not be absorbed by the cells in endocytosis, and this reduces their ability to transfect. Thus, after lipoplex formation you should proceed with the work as quickly as possible.